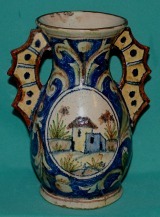 Maiolica is tin-glazed earthenware that was introduced to Italy around the 13th Century. Its name probably derives from the Italian word for the island of Majorca near Spain, through which Hispano-Moresque wares were shipped in 14th Century. The clay was twice-fired for durability, than enamels were applied to the glossy surface. Production and decoration before 1400 was limited and naive, but became increasingly sophisticated from the 15th Century. 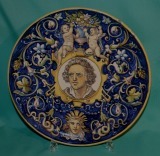 The main maiolica centers were Florence, Faenze, Deruta, Orvieto and Naples. 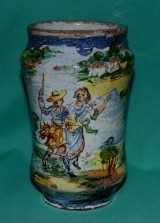 The number of potteries increased in the 16th-17th centuries when manufacturing peaked. During this period the decoration was colourful end elaborate, often depicting biblical and mythical themes. The images of these "istoriato" wares were inspired by the works of artist such as Raphael. 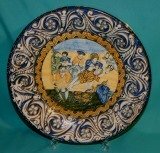 By the late 17th Century Chinese porcelain and French faience designs had become more influential and Italian maiolica no longer lead the field. 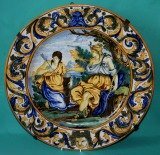 19th Century Maiolica Vase, signed "1535 N"
Large 19th Century Italian Maiolica Charger "Diana and Callisto"